As the year comes to a close, it is only customary that we look back on Heather and Mr. K's most eventful year yet and share some of the memorable moments, particularly for the months when ScottieMom.com wasn't yet created. What are your favorite Heather and Mr. K moments of 2012? January 2012 - We moved into our new home in Buckhead Atlanta. It was strange being so high up at first but it didn't take long for Mr. K to feel comfortable enough to "chase" the moving cars below. February 2012 - Mr. K and Scottie Mom rediscover the piano together. The piano's new location made it easy for Mr. K to play the instrument anytime he wants. March 6, 2012 - A date this Scottie Mom will never forget. After my first day on the new job, I came home to find a very ill Mr. K. Within minutes, he couldn't walk and began convulsing. We rushed him to the hospital. By the time we got him there, he barely had a pulse. To this day, none of the vets we have visited have been able to tell me what went wrong or give us a definitive diagnosis. Read more about Mr. K's brush with death here. April 2012 - We celebrate Heather and Mr. K's "gotchya days!" Mr. K, now fully recovered from his health scare, was rescued April 17, 2010. Heather was rescued around the same time a year later. 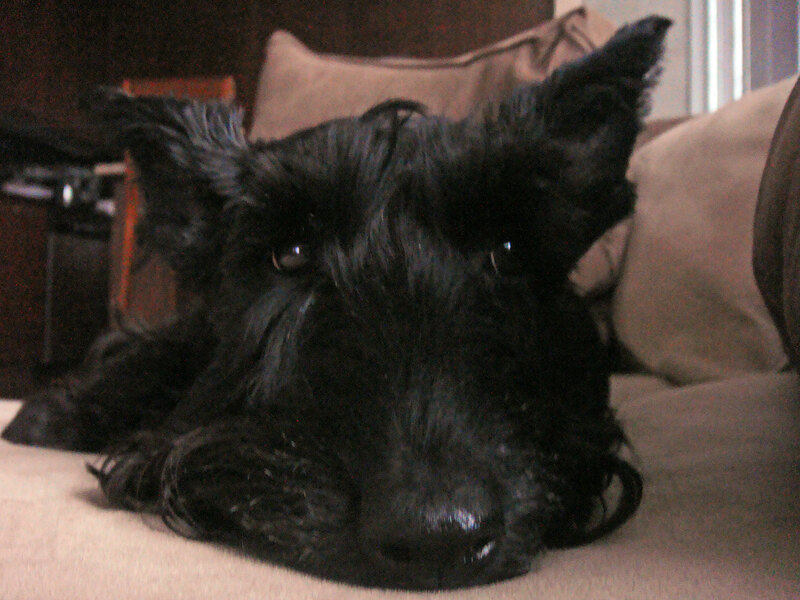 April 2012 was the first year I did not have the opportunity to rescue a Scottie in honor of my birthday. Perhaps April 2013 will bring one? May 2012 - Scottie Mom helps Heather and Mr. K's aunt with an idea for her muttastic photography. (A number of the pawesome photos you see here on the blog are courtesy of Heather and Mr. K's skillful aunt.) During the process, Scottie Mom came up with an idea to create a site of her own that might provide insight on Mr. K's health issue. And so, the idea for ScottieMom.com was born. June 2012 - Just three months after the day Mr. K got sick, we suspect Heather is sick. Her only symptoms are frequent urination and lethargy so we suspect a bladder infection. After running a few tests, vets have no clue what's going on but the illness seems to be similar in nature to what Mr. K experienced and Heather is hospitalized. Read the details of Heather's ongoing struggle to keep those liver values down in The Mystery Illness Returns. July 2012 - The first ScottieMom.com post was published! Plus, Mr. K celebrates the Fourth of July by swimming in Scottie Grandmadre's pool! He absolutely loves the water but cannot swim for the life of him so his aunt helped him enjoy an afternoon in the pool. To watch the video of Mr. K becoming a super swimming Scottie, click here. August 2012 - Project: International Scottie Love was launched. To date, we've had 90 photos of Scotties from 10 countries and 22 states across the United States submitted! September 2012 - Heather falls for Scottie Dad's best friend and receives her first kiss! October 2012 - Happy Birthday, Heather and Mr. K! 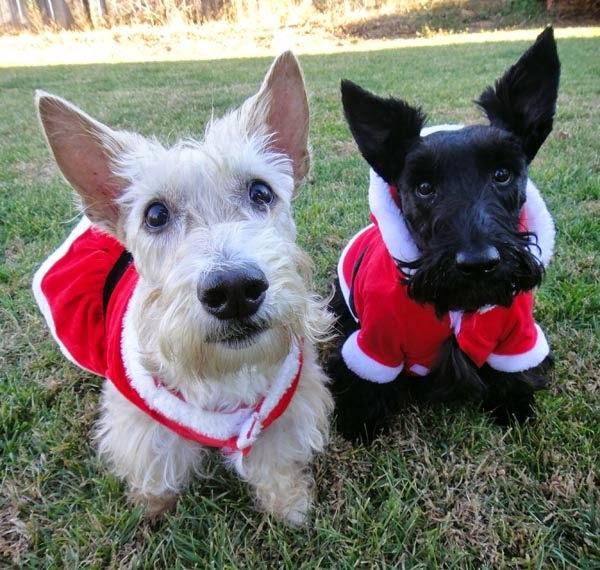 We celebrated the lives of these two Scotties with a special pawty this year. Later that month, Heather and Mr. K dressed up as their alter egos: Heather the Lion Queen and Mr. K the strapping, young Penguin. 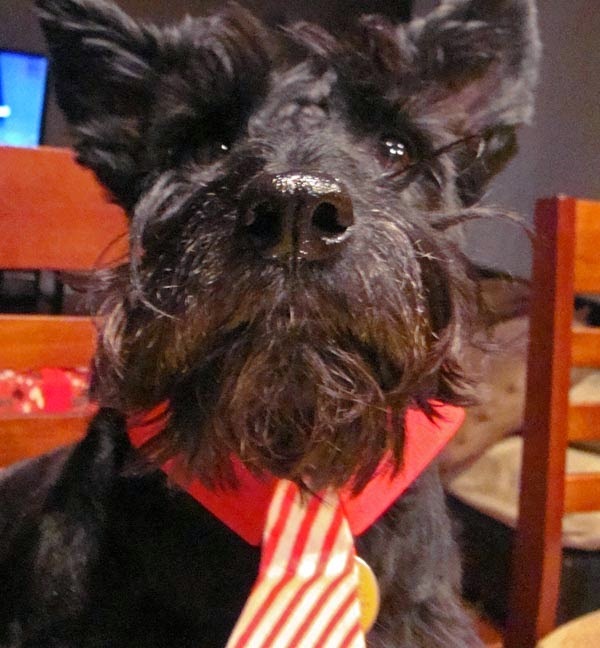 November 2012 - Mr. K elects himself president and launches a Scottie PR campaign in order to bolster the Scottish Terrier reputation and regain the ranks of the American Kennel Club's most popular breed listing. After all, Scotties have lived in the White House more times than any other breed so why not have one who’s actually president?! December 2012 - Scottie Dad asks Heather, Mr. K and Scottie Mom to be a part of his life forever in this very Scottie proposal! Best Christmas present ever!! Also, a special shout out to Kyla Scott, Zena, Midy Voelker (and Hootie! ), Dougall and Sharon for being some of Heather and Mr. K's biggest fans. Together, you've commented over 180 times on their stories! Much Scottie love goes out to you from Scottie Mom and family! For a Scottie, having a yard to patrol is very important. While Heather and Mr. K haven't been able to experience the luxury of having one of their own (YET! 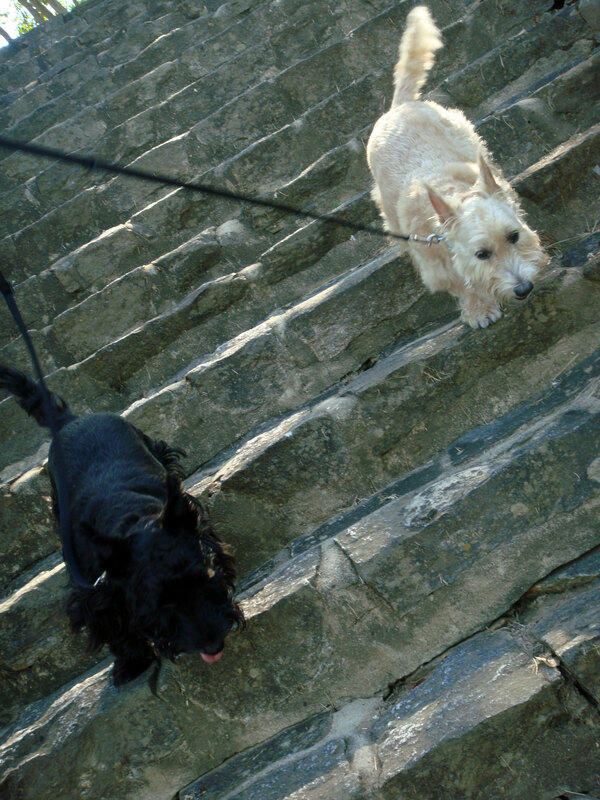 ), they have been able to maintain their Scottie Security responsibilities and even take them to new heights. Literally. Over the last year, Heather and Mr. K have expanded their Scottie Security protection beyond the Scottie Mom household to extend it to all of Buckhead Atlanta. Every morning and most evenings, they can be seen from our highrise balcony keeping watch over the lands below. Mr. K likes to keep his eye on the automotive traffic, ears perking up everytime someone beeps their horn. Heather, on the other hand, likes to watch over the pedestrians and wags her tail when she sees someone being "green" by walking to and from work. Together, these two Scots keep Buckhead safe and not an inch of land within their sight goes unnoticed. When all seems right with the world and their protective eyes have tired, Heather and Mr. K come back into the condo and collect their payment (a treat) for a good day's work. Then, they rest and cuddle up with Scottie Mom and Dad on the couch for some TV before bed knowing that when they wake up in the morning, they have a very busy world to protect all over again! 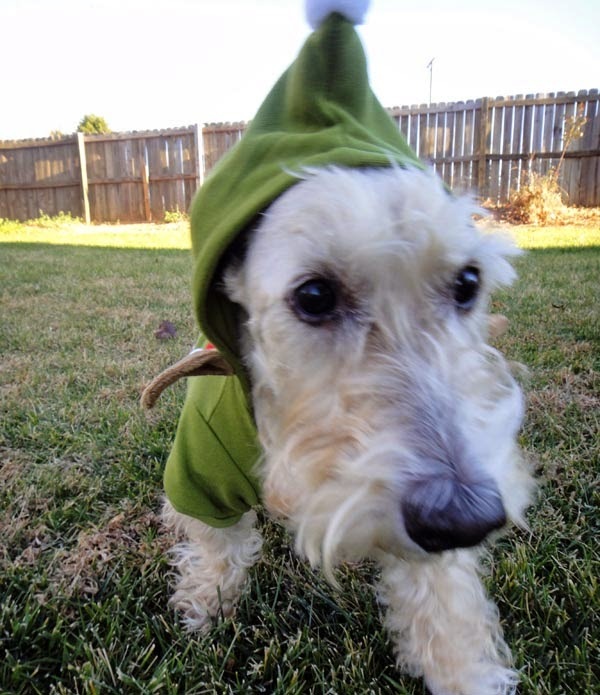 This morning, I came across an article on PawNation: "12 Out of Fashion Dog Breeds." Somehow, I knew our beloved breed would get a mention. Sure enough (and much to my disappointment), No. 3 of the 12 was the Scottish Terrier. While our Scotties do get a nod as "one of the most iconic breeds in the history of dogs" in this article, I had to wonder: does a Scottie really belong on this list? And have we, as Scottie Moms and Dads, become (dare I say it?) old-school? Ok, let's review what we know. There can be no denying our beloved breed is slipping the ranks of the American Kennel Club popularity list. (See my last post on this topic - "Top 10 Reasons to Love Scotties" - for specific rankings.) However, just because a Scottie dog is not a common household pet does not mean the breed has gone "out of fashion." You don't often see items of Prada, Versace, Gucci or Fendi being carried around by just anyone and yet, no one would dare say any of these are out of style. In fact, that's what makes these brands all the more appealing to the public: the fact that they are so elite, few people possess items designed by them. While I can't say Scotties would lose value if they did become common place and nearly every household had one (in fact, I feel many lives would be greatly enriched if they were), I can say that something may be lost. I think it is safe to say that Scottie owners now are fierce: fiercely loyal, fiercely independent, fiercely loving and even protective. These qualities are reciprocated in the Scottie breed itself. If Scottish Terriers were to become common place, I do fear for our beloved breed's well-being as the general public has proven to be very fickle in its love for furry friends. Take a look at our friends the Chihuahuas, made famous by the likes of Paris Hilton, Taco Bell and reality shows. Still a relatively popular pup today and yet, look how many can be found at shelters or worse. We already have a significant number of Scotties in rescues and looking for homes. Can you imagine how that number would grow? In the above-mentioned article, the author writes, "check out 12 breeds that are currently 'out of fashion,' but surely deserve a comeback." I argue this: the Scottie hasn't gone anywhere and won't be for a very long time. The Scottish Terrier is a timeless classic, not today's trend-of-the-moment. They may be rare, as are their owners, but they are all the more precious because of it. And while we Scottie Moms and Dads have a little work to do in modernizing the overall perception of our beloved breed (especially when it comes to producing and promoting items that adequately portray our iconic breed and ditching the kitchy ones! ), the Scottish Terrier itself is very much in fashion...don't believe me? Obviously, you haven't met my Heather or Mr. K...! Heather and Mr. K aren't quite ready to let go of the holidays just yet. Tonight, we dressed in our best, packed in the car and headed up the road to McAdenville, North Carolina - also known across the country as Christmastown, USA - to check out the holiday displays and take some photos to commemorate the season. Miss Heather certainly was the belle of the ball in her beautiful black and red dress, winning over nearly everyone that walked by us. Together, the two Christmas Scotties spread a little extra holiday cheer to the gathering crowds before the night was over and we left knowing Heather and Mr. K possibly had the best holiday season yet, full of surprises, treats, Scottie caroling and lots of hooman snuggles. (Plus, extra walkies!) All of us in the Scottie Mom household hope each of our Scottie friends and fans had a wonderful holiday! Feel free to share photos of your holiday adventures on the Scottie Mom facebook page. But as for Mr. K now, he believes. But once that door was open, Mr. K was gone. And in an instant, the food went SPLAT! Guess who turned the corner and MEOWed again? Here comes Scottie Claus. Here comes Scottie Claus. Running down Scottie Mom Lane. Look at all the Scottie dogs and all the other furry friends pulling on their leash. Squeaker toys squeaking, Scotties ArRRrOo-ing, oh how merry and bright! Hang your stockings and say your ArRRrOo's 'cuz Scottie Claus comes tonight. He's got a bag filled with undestructible toys for Scottie boys and girls. Hear those festive collars jingle jangle. What a beautiful sight! Jump in your Scottie bed and cover up your head 'cuz Scottie Claus comes tonight! He doesn't care if you're a rich or poor Scot. He loves you just the same. Scottie Claus knows that we're Scottie Mom children - that makes everything right. Fill your hearts with Christmas cheer 'cuz Scottie Claus comes tonight! He’ll come around when the Scotties sound…it’s Christmas 'morn again. Peace on earth will come to all if we adopt furry friends in need. 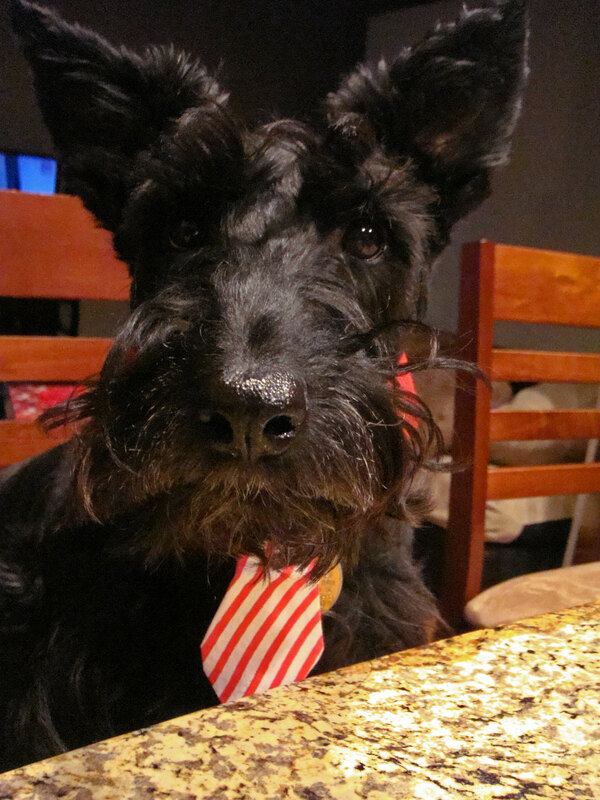 Let's give thanks to Scottie Moms and Dads 'cuz Scottie Claus comes tonight! Don't know what to get that special Scottie Mom in your life this holiday season? Look no further! Heather and Mr. K helped me compile a list of things they think any Scottie Mom would love to receive as a gift this Christmas. 7. Scottie Dog iPhone Case. Relatively inexpensive and oh-so-practical. Plus, there are tons of designs to choose from. The Scottie Mom on the go will smile every time she looks down at her phone as she's reminded of her beloved Scottie(s) at home! Try CafePress or Zazzle to start. 6. A stocking full of Scottie! Find the smaller Scottie items like Scottie novelty soap bars, Walker's Scottie Dog Shortbread, Scottie wallets, etc., wrap them up and place them in a Scottie stocking. 5. The Illuminated Steel Frame Scottie Dog Sculpture. For the Scottie Mom who's not afraid to show off her glowing love of the breed publicly by adding this sweet decoration to her outdoor holiday lights display. 4. Scottie Dog iPad cover for the technology-savvy Scottie Mom. Check out this fun one designed by Coach. 2. A customized photo album. Filled with photos of her one true love: Scotties! Better yet, support a local photographer in your area and surprise Scottie Mom with prints from the session. 1. 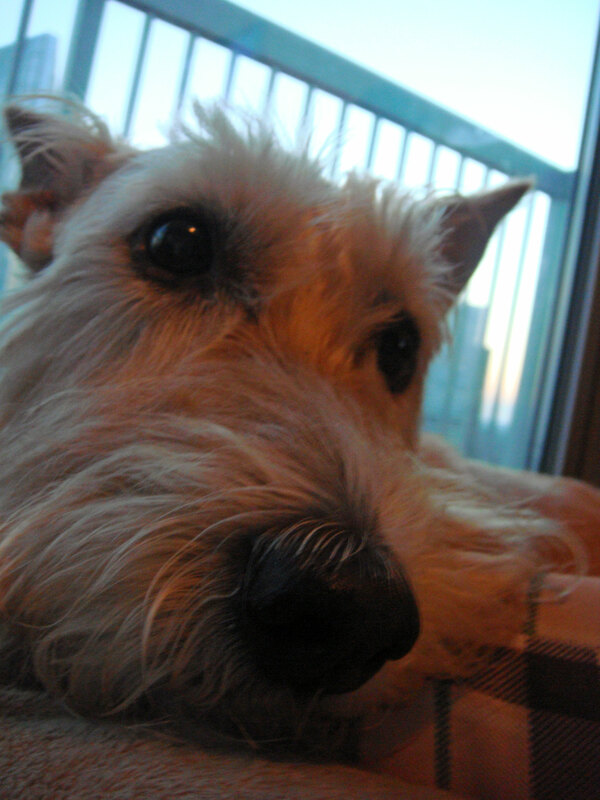 Another rescue Scottie. The ultimate gift you can give a Scottie Mom (or a Scottie Mom-to-Be)! 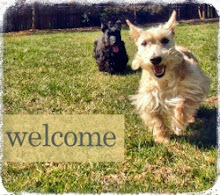 You'll not only be giving a Scottie in need the gift of a happy home but you'll be enriching your own life by opening your home to a little extra Scottie Love. P.S. Don't think we forgot about you, Scottie Dads. Check out these vintage Scottie dog cufflinks! Got other gift ideas you think fellow Scottie Moms should know about? Tell us about them in the comment box below. Happy Holidays! All through the year we've waited, waited through spring and fall to hear ArRRrOo's rooing, see winter time snow to bury our noses in for fun! Fresh-baked treats roasting over an open fire, the smell of yumminess at your nose. ArRRrOo's being howled by a choir and Scots dressed up in funny clothes. 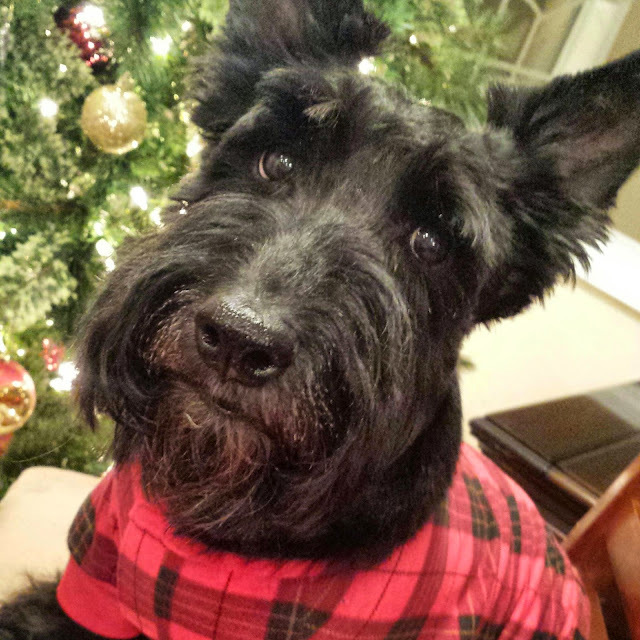 Every Scottie knows, a turkey and some hooman kisses help to make the season bright. Tiny Scots with their eyes all a-glow, will find it hard to sleep tonight. They know that Santa Scottie's on his way. He's loaded lots of squeaky toys and treats on his sleigh. And every Scottie Mom's child is gonna spy to see if Heather the reindeer really knows how to fly! And so, I'm offering this simple phrase to Scotties from all across the world. 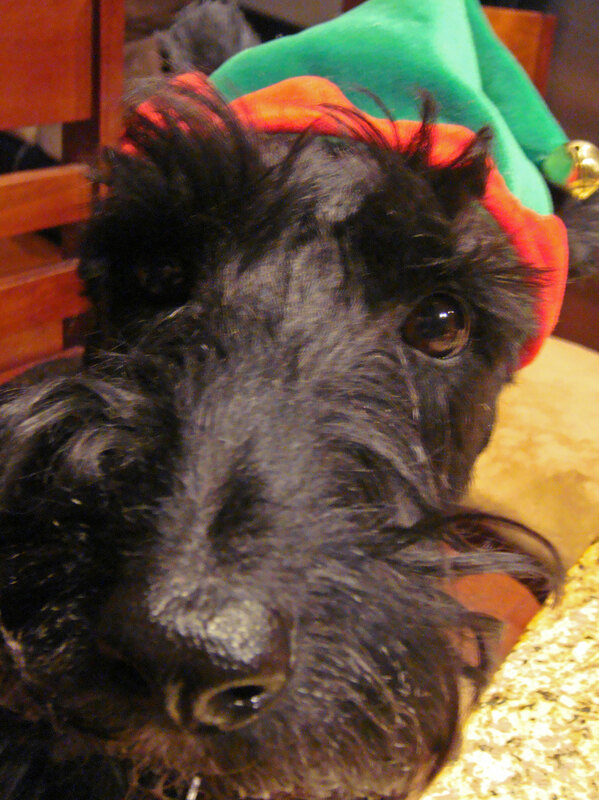 Though it's been said many times, many ways: Merry Scottie Christmas to you! Love and ArRRrOo's come to you and to you a great Christmas, too! And may Scottie Moms give you toys to last you through a happy new year! Love and ArRRrOo's come to you and to you a great Christmas, too! And may Scottie Moms give you toys to last you through a happy new...YEAR! Christmas came early in this Scottie Mom household! Scottie Dad and these cuties rendered Scottie Mom speechless when they unveiled a beautiful Tacori engagement ring as part of a very Scottie proposal. Of course, this Scottie Mom said yes. 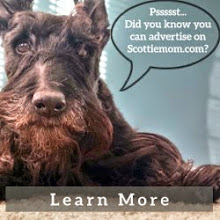 Who wouldn't with such a thoughtful Scottie Dad and irresistably adorable Scottie kids?! I open the door. I hear a jing-jing-jingling and little claws tapping on the floor. The lights are dimmed down. Here comes Mr. K running my way donning an elf costume. He's all smiles. Right behind him is my beautiful girl Heather, dressed as Mrs. Scottie Claus and looking so precious in her red dress. My heart melts. How did Scottie Dad manage to get them both dressed up without me? Regardless, this was the best welcome home present ever! I step into the living room. Scottie Dad's decorated the place for the holidays, complete with a beautiful little tree with artificial berries and pine cones. There are Scottie gift bags and boxes everywhere. Did Christmas come early? The tree is adorned with little Scottie tokens, each with their own message. Scottie Dad tells me to take them down, one by one, and see what the message says. It's a sweet love poem. He flips the notes over. There's another message on the back. It says, "Your present is under the tree." I look under the tree and see a large Scottie box. I open it. Inside is a small Scottie bag. I dig into it and find a tiny, red stocking...tied together with a Scottie pin. That's odd. Why is the stocking ripped? And why does it need a pin to hold it together? Scottie Dad says, "Stop. Now, look up." He takes the torn, red stocking from my hand and I look up. There are bright lights behind the blinds. Could they be in a shape of a Scottie, too? He raises the blinds. Nope - the lights spell out something. A very special something. It takes me a minute to realize what it says and before I know it, Scottie Dad is on one knee pulling out a royal blue box from the tiny red stocking. I don't think I even saw the ring before I answered his question and hugged him. Who wouldn't want to spend the rest of her life with someone like Scottie Dad?! As Scottie Dad and I settled in, he began to tell me the details of his Scottie proposal planning. Turns out, he originally enlisted Mr. K's help to deliver the ring in its cute little stocking to yours truly as I walked through the door. Naturally, Mr. K misunderstood his role and took the little, red stocking for ride once it was tied to his collar. Obviously, Scottie Dad had given him a new toy so why not defeat it? (Or so asks the wise Scottie!) And that, my friends, is how we ended up with a torn stocking in Scottie Dad's very Scottie proposal, version 2.0. Well done, Scottie Dad and kids! You made this homecoming the best yet...and possibly ever! It’s been months, perhaps even a year or more, since I last traveled without my Scotties by my side. I briefly thought of bringing Heather and Mr. K on a long car ride up north but decided that as much as I’d love to photograph my Scottie kids in the hometown I grew up in, 18 hours in a car was just too much for my precious pups to handle at any given time and we didn’t have much time to take the journey in smaller strides. And so, I boarded a plane, left Scottie Dad and the kids at home and headed to the great state of Rhode Island to pay my last respects to Heather and Mr. K’s Scottie Great Grandmadre. Thinking of how Heather and Mr. K ordinarily greet me at the end of each and every work day, I can only imagine what tonight will have in store as I open the doors to the apartment. A back flip, maybe? A once-in-a-lifetime giant Scottie leap from the floor all the way into my arms? Or better yet, a Scottie Dad rule reversal granting Heather and Mr. K unrestricted access to the hooman bed in celebration of the holiday season? Time can only tell. One thing’s for sure: one small turn of the key in the front door and they’ll come a-bounding! Heather here. I don't know who you are and I'm pretty sure you never even knew my Scottie Mom - your granddaughter - adopted me and my silly brother Mr. K. Lately, though, I've heard a lot about you. At first, I heard you were sick like me and Mr. K were earlier this year. I heard you went to the hooman doctor just last week and they found a mysterious infection. Mr. K and I hate those mystery illnesses...especially when they're equally hard to cure. I'm pretty sure Scottie Mom doesn't like them, either. You never know when they're going to strike. I hope you weren't poked and prodded like we were when we were sick. Anyway, I've noticed my Scottie Mom has been taking a lot of calls about you lately, more and more as the days went by. Until today, when they suddenly stopped. That's when I realized something was wrong. I found Scottie Mom sitting on the couch this morning on the phone with my Scottie Grandmadre. When she put down the phone, she didn't look at me or even send a smile my way. I started up my best helicopter tail. Slowly at first but fast enough to make her notice and once I did catch Scottie Mom's glance, I took my chance to walk on over and nudge my head against her legs until she reached down and offered me some pats on the back and a chin scratch. That's when she picked me up and put me in her lap. I'm not much of a lap dog like my brother, but I know when a good hooman needs my undevoted attention, so I sat down, looked up at Scottie Mom and flashed her my pearly whites. It worked! She smiled back and gave me a kiss. Still, it was filled with sadness and I soon learned that you went on to cross the hooman rainbow bridge. We never had a chance to meet but I'm sure I would've liked you and you would have liked me, too. (Eventually.) Everyone does. Scottie Mom says it is a gift I have that draws everyone to like me, whether or not they consider themselves a "dog person." I think that's why I'm so good at making hoomans feel better when they're blue. And while I'm not exactly sure where you are now, I can promise you that I'll be looking after my own hoomans in case you can't. Take care, my Scottie Great-Grandmadre. Know my Scottie Mom misses you and I look forward to meeting you and all my Scottie friends who have passed many years down the road from now. ArRRoOo! It started with a WHOOSH. My ears perk up. What was that? I turn left, nothing. Just Heather sitting in my bed. I turn right. Just Scottie Mom sitting on the floor. She looks at me and reaches over to pet me as if nothing happened. Just when I meet her glance, I hear it again. WHOOSH! Then, I see it. Scottie Dad's friend is behind it, trying to take the evil WHOOSHer down. He pushes and pushes but the thing is relentless. It WHOOSHES at my Scottie Mom, then at me. I must protect these hoomans. I bark. It WHOOSHES. I growl. It WHOOSHES. That's it! Now, the evil WHOOSHer is mocking me. I crouch down and show off my ferocious teeth. Scottie Dad's friend is no match for this WHOOSHer. He keeps pushing down on the WHOOSHer but it lives on. This is a job only a Scottie can handle. It WHOOSHES again. I take off, bounding toward it - barking and growling the short way there. The noise stops. I see Scottie Dad's friend back off. Oh, no! Doesn't he realize what will happen? I'm here to help him defeat the evil WHOOSHer, not defend hoomanity on my own. If he lets go, I'm vulnerable to an attack. Sure enough, it moves toward me. I bark letting it know I'm not afraid but I back off, far into a corner. I may be brave but I'm not stupid. These hoomans don't know what the evil WHOOSHer is capable of. It WHOOSHES at me again. I charge. It moves toward me again. Why doesn't Scottie Dad's friend have a good hold on it anymore? I back up. The WHOOSHer turns toward me and WHOOSHES again. And again. Time to activate my super Scottie powers. My back legs push with all their might and within a second I've caught the evil WHOOSHer by surprise. I rip off its snout. Now, Scottie Dad's friend springs into action. He exclaims and reaches for the snout as I thrash it from side to side, making sure it is good and dead. How dare Scottie Dad's friend try to take credit for ripping off the snout of the evil WHOOSHer that can WHOOSH no more? Like her friend Buddy, Heather the Elf passed through the seven levels of the Candy Cane forest and then through the sea of swirly twirly gum drops on her way from the North Pole to the city of Atlanta. I caught her as she was hurriedly tip-toeing toward her next destination. You see, Heather the Elf keeps tabs on everyone she meets and a quick tail wag alerts Scottie Claus of someone new to add to the NICE list. What are all our canine friends wishing for this Christmas? This weekend, Scottie Mom and the kids visited friends in Charleston, South Carolina. Hands down, the best part of our trip was bringing Heather and Mr. K to the beach on Sunday morning. Mr. K was absolutely thrilled to jump around in the waves and though Heather wasn't too thrilled to be near the water at all, she was eventually granted an all-access pass to roam the beach on her own due to good behavior. Up and down she would run across the beach...just along the shore but not too close to touch the water. Chasing after Mr. K (who was still running on his leash with Scottie Dad), Heather would then run back into Scottie Mom's arms for a quick hug and some pats on the back before taking off to see Mr. K and Scottie Dad again. Such happiness exuded from the freshly-converted Charleston Scots as we dusted off the sand and headed home!